Neil Cowan and the 1976 Puch Falco.The moped, which he bought as a wreck around 15 years ago and painstakingly rebuilt, has been stolen. Neil Cowan bought the 1976 Puch Falco as a wreck around 15 years ago and painstakingly rebuilt it before touring as far afield as Germany in its saddle. In October his 17-year-old grandson Joseph Walker was handed the keys and anticipated using the distinctive orange vehicle over the summer season. The moped had been stored in the back of a Transit van, which was taken from Strathview Terrace last week in what Mr Cowan believes was an opportunistic theft. The 86-year-old said: “The Puch being in the back was coincidental. It would appear, from what the police have told me, that their (the thieves) van was giving them problems and they set fire to it. He added he had been preparing the moped for use by his grandson. 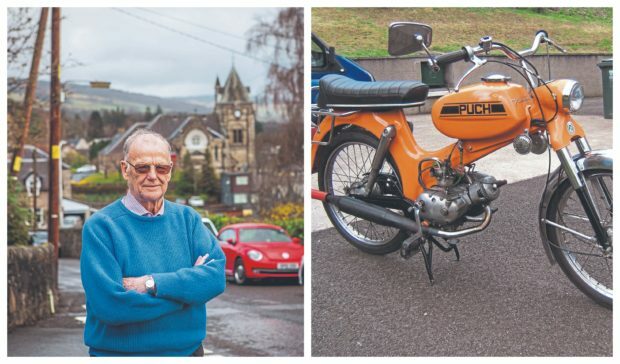 Mr Cowan said the loss of the Puch had hit him hard as he and the bike had shared a long history. He said: “I bought it about 15 years ago as a wreck. It was up Glen Doll and was advertised in the newspaper. It was a bit of a mess but the price was right so I went for it and it’s been totally refurbished. “In the time I’ve had it, it’s been out to west Germany. We ran a van down to Hull and then shoved it on a boat and then rode all out to Germany – a little group of us. A spokesman for Police Scotland said: “A blue Ford Tansit van, registration mark 9285 NC, was stolen from Strathview Terrace Pitlochry between Sunday March 24 and Monday March 25.